The en bloc resection of the superior mesenteric or portal vein with concomitant venous reconstruction may be required in patients with borderline resectable pancreatic cancer. However, performing laparoscopic pancreaticoduodenectomy (LPD) with major venous resection and reconstruction is technically challenging. Herein, we introduced a safe and feasible technique to perform LPD with major venous resection. Over the period of November 2015 to November 2016, 18 patients underwent laparoscopic pancreaticoduodenectomy with major venous resection and reconstruction using the anterior superior mesenteric artery (SMA)-first approach at our institution. Demographic characteristics, intraoperative and postoperative variables, and follow-up outcomes were prospectively collected. Eighteen male and ten female patients were included in this study. The median age of the patients was 58 years (range 49–76 years). Eight cases of wage resections, six cases of end-to-end anastomosis, and four cases of artificial grafts were performed in our series. Only one patient (5.6%) required conversion because of uncontrolled bleeding from the splenic vein. The average operative time was 448 min (range 420–570 min). The mean time for blood occlusion was 32 min, including 17 min for wage resections, 28 min for end-to-end anastomosis, and 48 min for artificial grafts. Thirty-day mortality was not observed in our series. The median postoperative hospital stay was 13 days (range 9–18 days). Three patients suffered from pancreatic fistula (Grade A), and one suffered from abdominal bleeding after subcutaneous injection with low-molecular heparin. In this case, abdominal bleeding was stopped through conservative therapies. 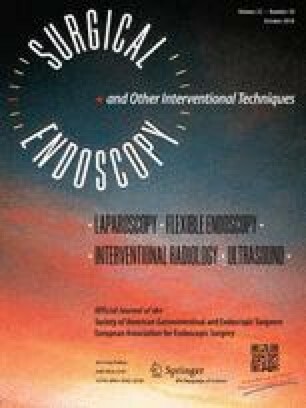 Laparoscopic pancreaticoduodenectomy with major venous resection and reconstruction can be safely and feasibly performed. The anterior SMA-first approach can facilitate this procedure and decrease operative time and blood occlusion duration. The video included in this paper was presented at the SAGES 2017 Annual Meeting. The online version of this article ( https://doi.org/10.1007/s00464-018-6167-3) contains supplementary material, which is available to authorized users. This study was funded by the National Institutes of Health of China (W2017ZWS07). Dr. Yunqiang Cai, Pan Gao, Yongbin Li, Xin Wang, and Bing Peng have no conflicts of interest or financial ties to disclose.